Need more space but don't have any room for an extension to your house? Adding a garden room could be the perfect solution to creating more liveable space without the need and expense of extending. However, adding a garden room is not as simple as putting up a shed – there's lots you need to know about planning and design to get it right. Here's how to choose and build yours. Afterwards, head to our dedicated feature on designing a garden from scratch more garden-related advice and ideas. Will it be a home office, cinema room, home gym? Perhaps a hobby room or children’s playroom? Or maybe you'll use it for outdoor dining when the weather’s cooler, or as a sheltered spot to enjoy the garden from? The answer to these questions will help you decide on practicalities, such as whether it is for year-round use or warmer months only. You’ll also need to decide how sturdily built and well insulated it will have to be, and whether you need Wi-Fi, electrics, heating and lighting. Consider storage, too. Does it need to include extra space, possibly with its own entrance, for the tools and lawnmower that might previously have been stored in your shed? Garden room costs vary according to their size; whether they are modular or bespoke; the quality of the materials used; the doors and windows specified; the level of insulation required; and the interior and exterior finishes. For a modular kit, expect to pay anywhere between £2,000 and £30,000. For a completely bespoke building, expect to pay between £800 and £1,600 per square metre. An all-year room requires heating, ventilation, insulation and electricity. If you go for a bespoke option, this will be arranged for you, but make sure the price includes connection to mains electricity. This requires a Part P registered electrician to relay power through armoured cabling and will cost between £300-500. You should also receive a certificate stating that the work meets current regulations. Do you need planning permission for garden rooms? they must not be used as a home. You will definitely need to apply for planning permission on an annex or garden room if you plan on using it as a dwelling. Check whether your local council advise that you apply for a lawful development certificate before any work takes place. Find out if you need planning permission for your garden room. Assuming your garden building is of solid construction, it should need no more maintenance than your home – perhaps a fresh coat of preservative on the cladding or paint on the woodwork every two or three years. The most vulnerable part of your building is probably its base, so when designing it, allow for the movement of air beneath; this will prevent a build-up of damp that will lead to rot and decay. Garden rooms can be positioned anywhere flat and dry, but think carefully about where to put yours if your plot is on the smaller side – and ensure its best possible angle is visible from the house. Never build in the garden’s only sunny spot, unless your new room has doors that open out to create a sheltered suntrap. Instead, consider placing it in a shady area where it’s difficult to get plants to grow; so that it blocks a view of an ugly building at the back of the garden; or so that it improves privacy within your garden. Think, too, about whether to allow space around or behind your building for access and repairs. The size of your garden room is governed by planning regulations, but, as a general rule, it should be big enough to be useful and to evolve as your needs change, though not so large it overwhelms your garden or throws too much of it into shade. To better visualise its proportions, mark out the proposed boundaries with string or canes. Rethinking its size? 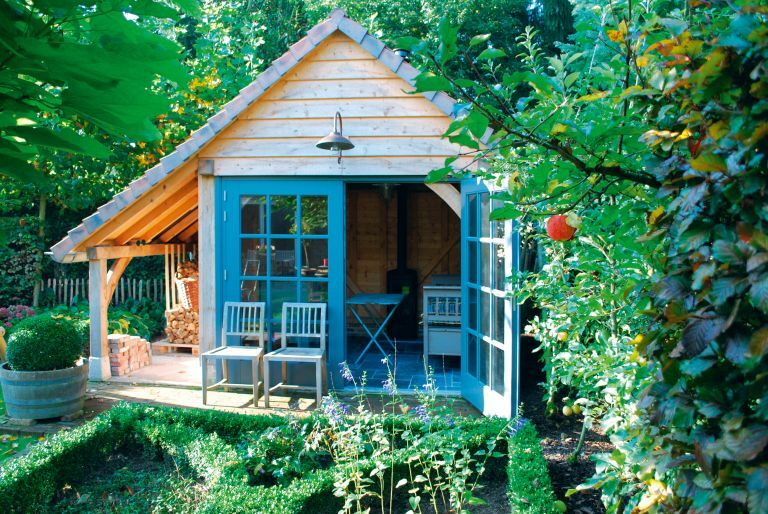 Consider investing instead in a really well-designed garden shed. Consult out buyer's guide to the best garden sheds before choosing yours. The overall design of the building should complement that of your home and garden, but it may not be practical to mimic the gradient and angles of your home’s roof. Instead, you might like to think about gently sloping a living roof towards the house so that the foliage, flowers and wildlife can be appreciated from indoors. Ask your supplier if they can create a green roof for you as part of the package – if not, there are plenty of specialist companies who can; all you’ll need is a watertight roof construction that can take the weight. Tongue-and-groove exterior wall cladding is standard, either pretreated or stained to suit your colour scheme. Consider the thickness of not just your walls, but the floor and ceiling, too – thicker or insulated constructions will be needed for buildings used year-round. If you want a structure that looks more permanent, have it brick- or block built and rendered – but bear in mind these materials, along with large amounts of glazing, will add significantly to the cost. Check out our guide to exterior cladding. Windows and doors shouldn’t just reflect the style of your house; their size, shape and position should also be designed around how you will use your room. So, if you need lots of wall space for a desk and storage, for example, glazing all round may not be practical. The spec of the glazing needs to reflect how much – and when – you’ll use the building; a year-round home office is best double-glazed, while a summer sunspot will only need single glazing. Although you want to reflect the style of the rest of your home in your garden room, it needs to be a bit more robust. Flooring, for example, needs to stand up to continual access from the (often very wet) garden; curtains, blinds or shutters might be needed for shade in a south-facing room; and furnishings may need to be washable, particularly if the room will be used regularly by children who won’t think twice about going from paddling pool to sofa. If using your garden room as a home office, you will need to consider heating; an oil-filled or halogen heater will make the most sense, since you can simply unplug it when you're not in. Once you’ve chosen a garden room, position outdoor lights and plants to show off and frame it. You may also want to factor in decking – check out our amazing decking ideas for inspiration. Should you choose a modular or bespoke garden room? A modular garden room is ordered and supplied in kit form, with some basic elements of customisation available, while a bespoke option will be designed to fit your space and then built on site. With a modular garden room, you know up front exactly what you are getting and for how much. Most companies that sell kits will offer add-ons, such as insulation, door and window options, and storage areas, allowing you to create a somewhat tailored finish. However, you will be fairly limited to what’s on offer in terms of the building’s size and shape – which may not suit an awkward plot. Many modular buildings are sold for DIY installation, with the pre-assembled walls and roof elements supplied, which saves on costs. However, it’s a job for an experienced DIYer with the right tools – and an extra pair of hands. Bear in mind, too, that the levelling of the site and the construction of the base – whether solid concrete, blocks, paving or timber – is a major part of the job. If installation is beyond you, you could employ a trusted local builder, or ask your supplier if they offer a build service for an additional cost. With a bespoke design, whether dreamt up by you or an architect, you’ll get a building that exactly meets your needs, design ideas and the size and shape of your plot. It will also allow you to be more adventurous with materials and finishes. However, unless you’re a budding builder, this is a job for a professional, which may make the final cost a little more unpredictable. It's likely, if you're redesigning your garden, that you're rethinking your garden lighting, too. The best thing about garden lighting is that you can focus attention on not just plants, but your garden room, too. The secret, however, is not to overdo it – only illuminate it subtly as a little light goes a long way in the dark. Get more detailed advice on how to plan your garden lighting in our guide. Inside, approach the lighting as you would a room indoors, depending on its use. So, if you're using yours as an extra living space, follow our guide to lighting a living room, for example. Fit a PIR light and home security system (if the contents are valuable – perhaps you work from home and have computer equipment inside) to pick up any movement. Smart security systems that you can connect to via your phone are a flexible, easy to install option that you can use on the move. Attach your computer to the walls with metal security casings – most burglars don't want to make a noise when stealing your kit. Talking of which... laying a gravel path to and from the garden building will make entry as noisy as possible. Check your insurance policy – worst comes to worst, do your door and window locks meet your insurer’s expectations?